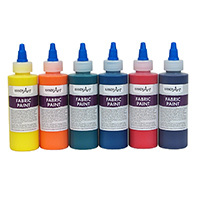 Handy Art® Fabric Paint opens up endless possibilities of creativity on fabric projects. Works on natural and most synthetic fabrics and can be applied directly from bottle tip or brush, stamp, sponge, block or screen printed. Dries to a soft, flexible finish. Heat setting with an iron is required for a permanent and washable finish. Handy Art® Fabric Paint is certified AP non-toxic.